I’ve been back into the swing of catering for the last month doing benefit suppers and the occasional business meeting, but this weekend marks the first wedding of the season! I love the first because I haven’t been drug down by the weight of a 1000 other weddings, or the insane heat of the summer (let me tell you, an oven on at 400 degrees when its already 30+ degrees outside, makes for a slightly flustered Virginia). On the flip side the first also means dusting off the wedding accessories, chaffing dishes, and getting the tablecloths ready for another season. 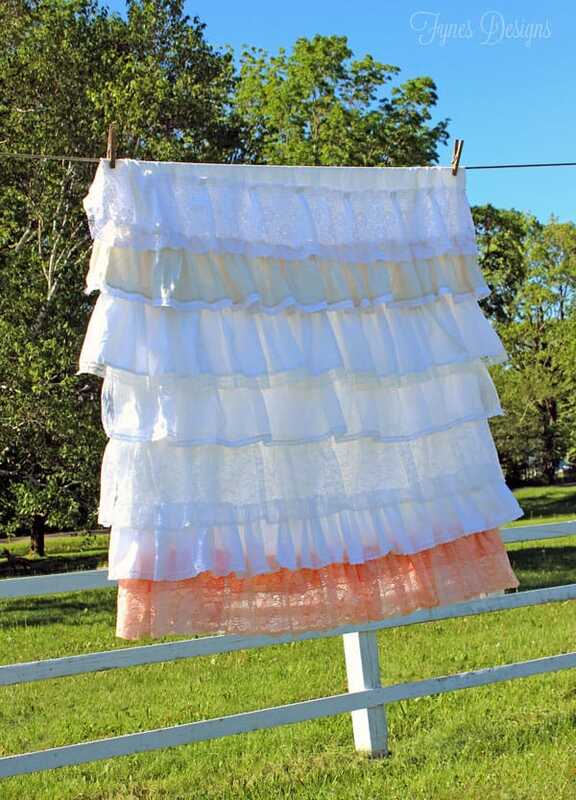 While digging through the bins of tablecloths I stumbled upon this vintage lace ruffled tablecloth that I made for a rustic wedding last summer and I hadn’t got a chance to share it with you. If you have ever bought lace from a fabric shop you’d know how expensive it can be, so when i’m thrifting I always pick up little pieces and scour the remnants. 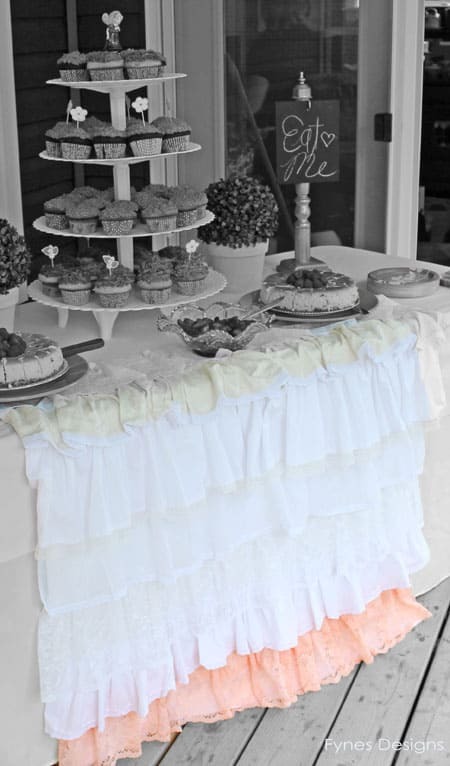 I wanted to create a tablecloth that had a bit of a romantic feel, and this ruffled tablecloth is what I came up with. 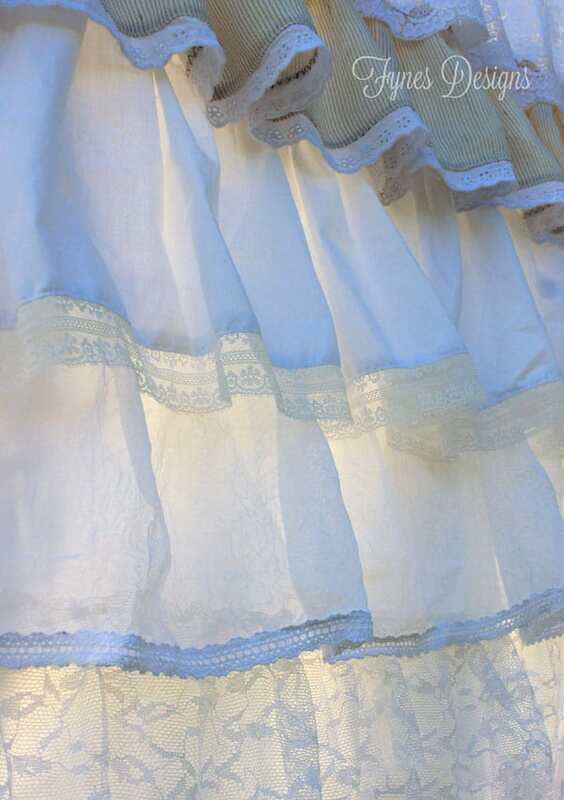 I started with a while flat twin bed sheet and gathered each lace strip along the top edge to ruffle it. Then sewed each layer to the bed sheet starting on the bottom. 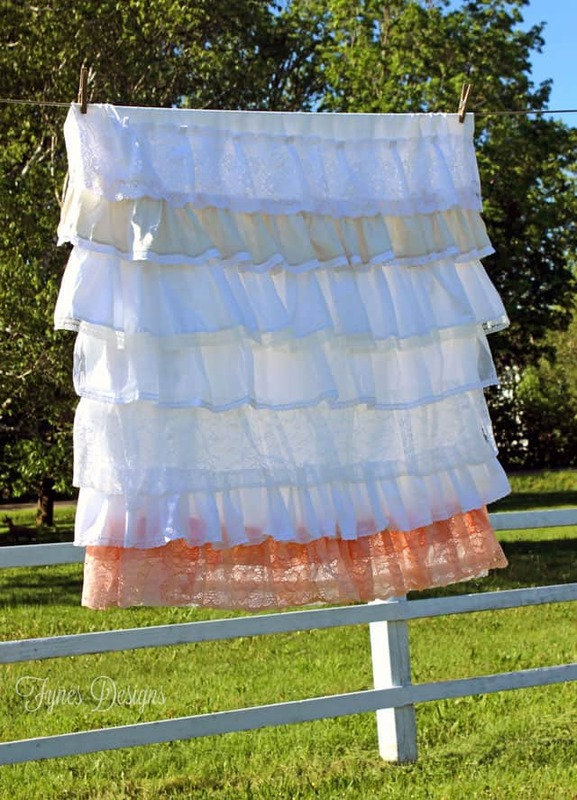 I used the same method for my kids ruffled apron. If you can sew a straight line you can master this easy sewing project! To finish the lace I added May Arts Ribbon trims to the edge. They have a wonderful assortment of eyelet and lace to choose from. I love the peach lace I came across but thought by putting it as the bottom layer it could easily be tucked under if it didn’t coordinate with the color palette of the wedding. If you’re interested in additional rustic wedding ideas for your tablescape, please view my catering page. Gorgeous V! Now I want to go out and buy spools and spools of ribbon and make one of my own! That is adorable! I’ve never seen a cuter tablecloth! Love, love, love! So summery looking. I have mounds of fabric and ribbon that needs to be made into one of these! What a lovely touch to the table! I love little details like this! This makes for an adorable tablecloth!! But I think this would also make an adorable curtain. Oh you make me want to pick up sewing and make this!! Oh a curtain, great idea!! Wow.. So pretty!! Love the soft color palette you chose! thanks Marni! I love the soft colors too, It has worked well for a bunch of different occasions!